Here I am trying to keep my system up to date and what happens again? AMD breaks it, over and over and over. I'm sick of it. I installed the Windows 1809 on Saturday night before it was pulled. Yesterday I installed the patch for it. I posted that OpenCL was not loading after the first update. Hoping 18.9.2 would fix it but noooooooooooooo……! I'm a photographer and need OPENCL to run with my software. AMD broke it last year and I had to reset my system. This is an all day effort for me and I am sick of having to do it. For that matter, I don't know whether a reset would resolve the problem. Many probably don't even know that OpenCL isn't loading with the new drivers. GPU-Z shows whether it's running or not. It makes a big difference in how well Capture One software runs on my system. I appreciate all the feedback on my OpenCL issue. A Reset of Windows 10 1809 resolved the issue. Windows major releases and I do not get along. This is the third time over the past year I've had to reset after a Windows Upgrade. Combined with AMD's own drivers issues, this really is a PITA to isolate and resolve. The posters on this thread helped showing they were not having the same issues. I have found other discussions where some are having the same OpenCL problems. I used the Win10 1809 Reset option where files and settings are saved. This was the first attempt before wiping the drive and reformatting with a full reset. I was lucky this time around since I've had to do the full format and reinstall of Windows 10 in the past to get OpenCL working again. I have learned that Vulkan and OpenCL (version 2.2) will be merged into one single API. I am wondering if by merging the two into one API GPU-Z is not seeing OpenCL anymore. So I am wondering if Vulkan and OpenCL has finally been merged into one Vulkan API will GPU-Z or other GPU programs still detect OpenCL activated on the GPU Cards? Great that you found a fix for your OpenCL problem. I would suggest you mark you last comment as "Correct" so others Users in the future will know a possible solution if their GPU card doesn't show OpenCL activated. By the way, When you Reset your Windows, do you need to install all your personal software and programs again? I know there are 2 or 3 selections on Reset Windows Menu. But is seems like all selections involve installing personal Apps again. I was wondering if you would have done an Windows Ingrade Repair instead of a Windows Reset if it would have had the same results or fix. I have never done a "Reset' yet on my computer. Rather I perform an Ingrade Repair which installs Windows again but without removing any personal software or programs. It is the same as upgrading your Windows version to the latest without doing a clean install except you are reinstalling the same Windows version on top of the current Windows version with a new Windows folder. It even creates a Windows.Old folder. I am asking to find out which method is better since I am not familiar with Windows Reset and you have done it more than once. Thanks for letting me know your solution. Will be useful in the future troubleshooting this type of problem. 3) I have tried SFC /SCANNOW and the DISM repair commands many, many times for the OpenCL problem with no success. No errors are reported by either. Here's the screen shot under System Recovery, I used the Keep my Files option. I took about 30 minutes with my WD 1TB NVME drive. You can delete Windows.old any time by using Windows Disk Cleanup. Right click on the C: drive under Properties you will see "Disk Cleanup. Click on that and when the Disk Cleanup menu shows up than click on "Cleanup System files". There you will see about deleting Windows.old folder. Next time try a Ingrade Repair. Run the current Windows installation on your Desktop. When it finishes you shouldn't have to reinstall any of your software and you should have a new Windows Folder installed. If it fixes your problem if it should occur again than you know it is a better option than Resetting Windows. But if it doesn't fix it, then reset Windows again. Either way, if you should remember this thread I hope you will post what worked best. The Ingrade Repair or the Reset. Thanks for the final answer. By the way, I have noticed that Windows Restore is kinda useless. Most of the time it fails or doesn't restore completely. The only good thing about Windows Restore it restores the Registry back to where it was working correctly. I usually end up doing a System Backup Restore which is almost 100% effective in restoring your computer back to the way it was exactly when you Backed up the C: drive. Hopefully, Windows version 1809 Windows Restore is more efficient at restoring your computer than in the past version. 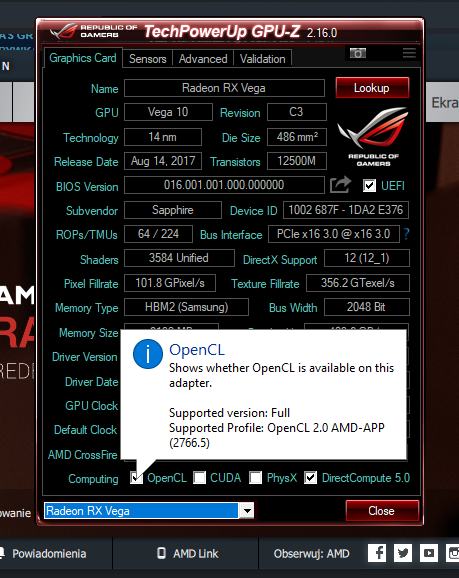 Update the AMD Radeon software to the current version and check GPU-Z again. Auros can be uninstalled after OpenCL is deemed running again. I'm not using OpenCL in any of my programs, but out of curiosity, decided to download GPU-Z and check if it shows on mine. It does indeed show as enabled. I'm running windows 10 1809 with latest updates, and a 4GB XFX RX480 with the 18.10.1 drivers. Don't know if that helps or not. OpenCL is Working For Me. Thanks, your images of OpenCL being activated answers my question about Vulkan & OpenCL merging into one Vulkan API. I have found a solution to the problem! it is different than yours. Signed up the forum just to confirm jero_tattoo's solution works. You are life saver!